practice. To that end, while continuing to teach full time, Dr. Marieb pursued her nursing education, which culminated in a Master of Science degree with a clinical specialization in gerontology from the University of Massachusetts. It is this experience, along with stories from the fieldndash;including those of former students, now in health careersndash;that has informed the development of the unique perspective and accessibility for which her texts and laboratory manuals are known. nbsp; In her ongoing commitment to students and her realization of the challenges they face, Dr. Marieb has given generously to provide opportunities for students to further their education. She contributes to the New Directions, New Careers Program at Holyoke Community College by providing several full-tuition scholarships each year for women returning to college after a hiatus or who are attending college for the first time and would otherwise be unable to continue with their studies without financial support. She funds the E. N. Marieb Science Research Awards at Mount Holyoke College, which promotes research by undergraduate science majors, and generously contributed to the University of Massachusetts at Amherst where she provided funding for reconstruction and instrumentation of a cutting-edge cytology research laboratory that bears her name. nbsp; In 1994, Dr. Marieb received the Benefactor Award from the National Council for Resource Development, American Association of Community Colleges, which recognizes her ongoing sponsorship of student scholarships, faculty teaching awards, and other academic contributions to Holyoke Community College. In May 2000, the science building at Holyoke Community College was named in her honor. nbsp; Additionally, while actively engaged as an author, Dr. Marieb serves as a consultant for the Benjamin CummingsInteractive Physiology reg; CD-ROM series, and is an active member of the Human Anatomy and Physiology Society (HAPS), the American Association for the Advancement of Science (AAAS), and Sigma Xi. 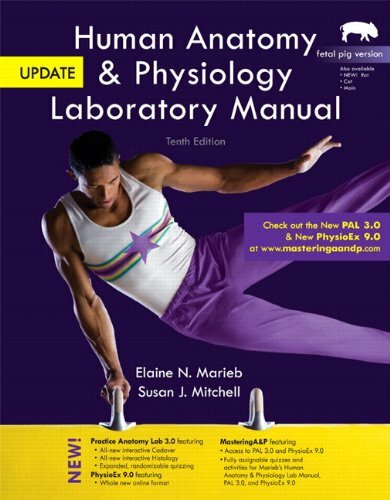 nbsp; Susan J. Mitchellearned her Ph.D. in physiology from the University of Michigan. She studied the cellular basis of behavior before joining the faculty at Onondaga Community College where she is currently a professor in the Department of Biological Sciences. Her research in neurophysiology and training in physiology positioned her to write the original Nervous, Endocrine, and Digestive System modules in the Interactive Physiology 10-System Suite tutorial program. She has been honored with a NISOD Excellence Award for teaching, and been awarded several grants to develop technological resources for biology at OCC. Dr. Mitchell is a member of the American Physiological Society, National Association of Biology Teachers, National Science Teachers Association, and the Human Anatomy and Physiological Society (HAPS), where she is currently active on the Curriculum and Instruction Committee.